Here is a photo from Amazon.com’s site of someone reading from the new Kindle. The Kindle is an electronic book, which one can tell from the reader reviews (3000 plus!) is really just a slim slate (and this reader swears by hers, although she wasn’t able to “buy” books in places like Guatemala, it still allowed me to read samples of the 250,000 titles they have and which I had downloaded maybe twenty samples. and of course any titles I had already purchased,The real power of the Kindle hasn’t even been tapped, like its name, its a movement that hasn’t even begun to “catch fire” but it already gives a lovely light and definitely is a super way to travel with 100 books in one’s purse or briefcase! We see, the power of the Kindle in the deals it now makes with publishers when books are requested to be available on the Kindle. The ability for publishers to put their out of print books as well as their current lists on a Kindle and access readers without incurring massive production costs. Most Kindle titles are $9.99. Let’s start a Kindle Anaïs Nin revolution. Sign on to our web site and from the bookstore links, ask that the Diaries be available on a Kindle. Follow this link to see a sample link. This may take time and dedication, but we need your help! Everyday,(particularly all you wonderful followers!) log on to the bookstore and go down the list and where it says CLICK HERE TO ORDER just click on and when you see this image of a Kindle check the link that says: Tell the Publisher! I’d like to read this book on Kindle. Let’s not all start with Fire! Valerie Harms has been kind enough to send on a few postcards from the Celebration weekend. If you would like a postcard, please send a S.A.S.E. 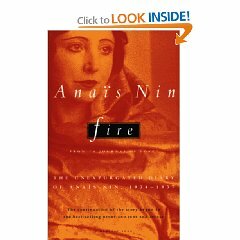 to Anaïs Nin Web Site, PO Box 412 Beverly Shores, IN 46301. Or if you are overseas just send us your name and address on a postcard! We’ll send one back even if you are not in the US. First fifteen responses will benefit from Valerie’s generosity.